Cosmelan is the most effective depigmentation treatments. Phase 1 is an in-office procedure when the Cosmelan® peeling mask is applied by a medical doctor. The mask is kept on the skin for several hours (8 to 12 hours) and clients remove it at home according to their doctor’s instructions. Phase 2 involves the use of Cosmelan® home care products for the following 2 to 3 months. HOW EFFECTIVE AND SAFE IS COSMELAN® TREATMENT? In 99% of cases involving hyperpigmentation of epidermal origin, the blemish elimination process can achieve a 95% efficacy rate. The lightening of pigmentation and more rejuvenated skin is observed as early as one week after the treatment. Cosmelan® is safe for use during any season provided that the client uses sun block daily. Cosmelan® is also safe for any skin type (type I to VI according to Fitzpatrick’s classification) including Asian and African skins. There is a down time expected, the duration of which varies. WHO CAN BENEFIT FROM COSMELAN®? Cosmelan® is effective against any type of hyperpigmentation on the epidermal level (most types of melasma, chloasma, and dark blemishes from acne scaring and sun damage). It is beneficial for both men and women. Clients with fine lines, acne scaring or poor skin texture will notice dramatic improvement and more rejuvenated and radiant skin after Cosmelan® treatment. Cosmelan® is not recommended for clients with skin conditions like eczema, psoriasis, malignant lesions, and skin infection. It is not recommended for use in pregnant and breast feeding women. For more information on Cosmelan® treatment contact Radiance for You. The clinic offers a variety of the latest as well as already established medical aesthetics treatments for different skin conditions and anti-aging. Based on the latest studies we often combine these treatments with laser/light and radiofrequency therapy for enhanced and long term results. 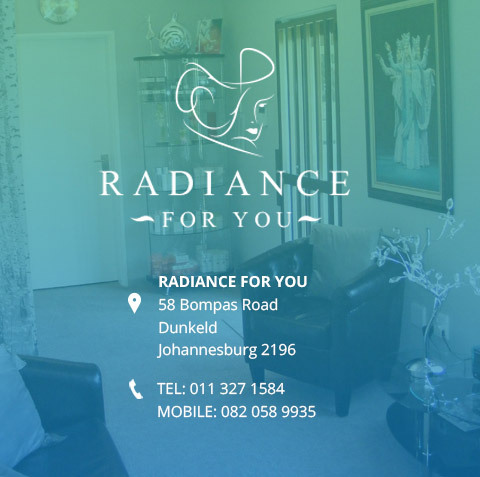 Radiance for You offers a state of the art third generation of laser/light and radio frequency combined, non-invasive treatments. All Rights Reserved. Designed & Developed by Citrus Creative.